Introduced to the marketplace in 2012, the Magnum XL is a continuation of the popular Magnum 6-speed series. Featuring all the most important content from the original Magnum, the XL retains its brute strength and sophistication, but eliminates its multiple shifter locations and dual speedo outputs.Refinements include a new extended length tail section designed to eliminate the semi-remote shifter found in many popular late-model applications. 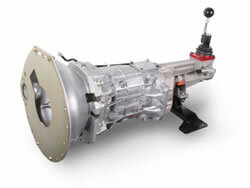 Initially available for the 2005 and up "S197" Mustang, the Magnum XL was designed specifically to replace the OEM 5 or 6 speed transmission where performance improvements are desired. Simplifying the swap, the Magnum XL includes a SFI-approved steel bellhousing, crossmember, trans mount isolated shifter and shift ball and even reuses the OEM hydraulic clutch relase system.